Do you have any VirtualBox/VMWare/Hyper-V images you're already using but you'd love to have them in your antsle? Now you can! 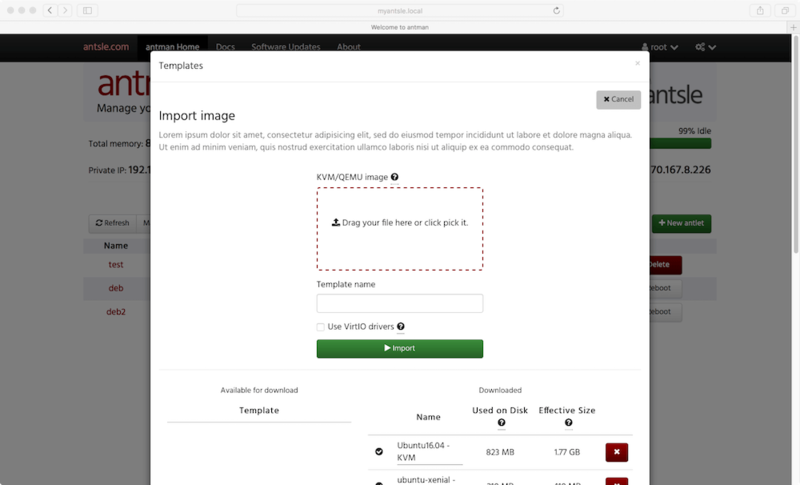 Open your ﻿templates﻿ manager and click on "Import KVM/QEMU image". We support any KVM/QEMU image file, such as: .raw, .bochs, .cloop, .cow, .dmg, .iso, .qcow, .qcow2, .qed, .vmdk, .vpc, .vdi, .img, .vhd, .vhdx. Just drag your existing antman VM file onto antman, and you're done! With this release you ﻿can﻿ now manage your antlet's virtual disks directly from antman. You'll be particularly happy about this feature if you happen to have an HDD add-on, as it has never been this easy to get the most of it! Small improvements to UI/UX & bug fixes.